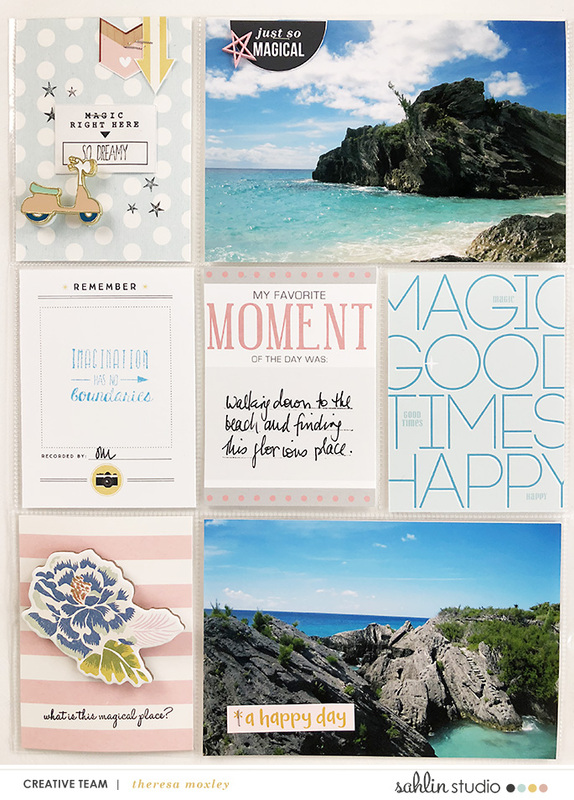 Hello friends, it’s Theresa here on the blog to share another fun layout in our Bermuda Honeymoon album. 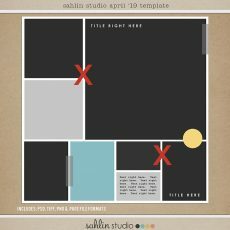 A few months ago I created a hybrid layout for this album and have used it as the springboard for the layout that will be right beside it in the album. 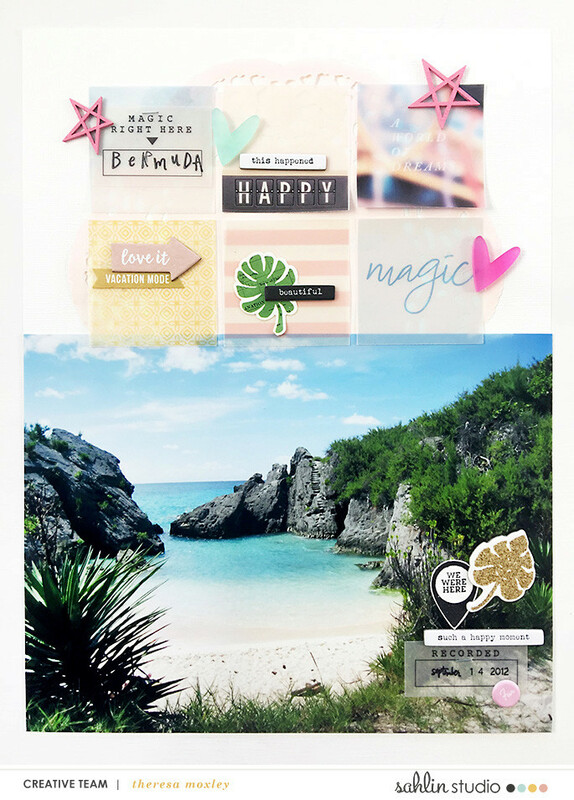 I have used the Project Mouse: Beginnings collection for both of these layouts, which is absolutely stunning for any sort of beach themed page! This is the layout I created previously. 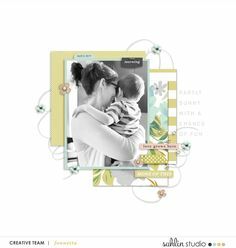 It is a hybrid layout where I planned out my layout using Photoshop and then printed each element and adhered it all together. You can see more about this layout here. This layout is about a particular day we were exploring around the island and we discovered this amazing beach called Horseshoe Bay. The whole area is just beautiful, with white sand beaches, cool crystal blue waters, and interesting rocks that you can hike around on. There were so many photo opportunities, and of course when I selected my photos to print for the album, I included quite a few. 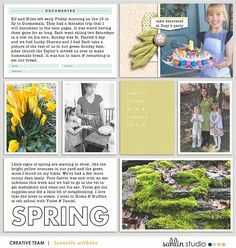 And I love this about pocket pages: it allows you to include so many photos in a really simple way. This is the left side of the layout which I am sharing with you today. I was so excited to work with the Project Mouse Beginnings collection again and love how perfect the pastels blend with these photos, and I also love the theme of magic. This was a very magical place for us! Taking color cues from the right side, I repeated the light blues and pinks. Pro tip for quick printing for printing digital products: keep 4×6 matte card stock handy so you can print your journal cards easily. For this layout I only needed 3×4’s, so I ran them through the printer aligned to the far left and then turned the card around to print the second. I then lay out a few of the elements onto a 4×6 card and print those as well, and cut them out quickly by hand. I had a mini stamp set from Pinkfresh Studio Dream On so I used that to stamp the stars below. The enamel scooter pin is from My Mind’s Eye. Whenever I use those I use tin snips to cut the back off and then adhere it using a pop dot to make it less bulky in the album. For my journaling on this page, I kept it very simple. I have included quite a few pages about this particular beach so I feel like I have written about it over several pages. Here I wanted to simply write about the experience of turning the corner on the island and finding this magical place! The pop of pink from the stripe card echoes the pink on the other side of the layout, and contrasts so beautifully to the blues in the photos. 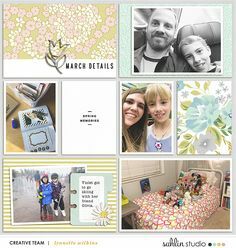 The floral chipboard is from Crate Paper Here and There collection. To add dimensions but not bulk, I pull apart the backing from my chipboard pieces and then adhere them using a liquid adhesive. 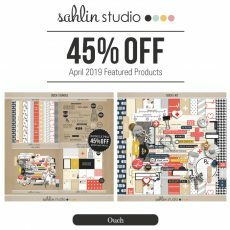 Hybrid memory keeping really is the best of both world – using gorgeous digital elements along with physical pieces for texture just makes my heart happy! Thank you for joining me today for another Bermuda honeymoon layout. If you would like to see my process video for this layout, you can view it here. 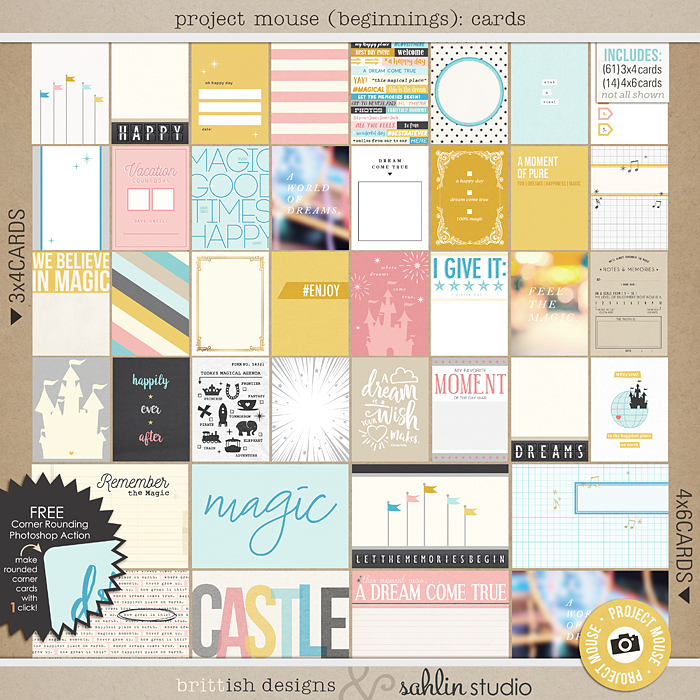 Other Products used in the layout include: Project Mouse Beginnings Bundle. My Mind’s Eye (enamel scooter pin); Crate Paper (chipboard); Pinkfresh Studio ( Dream On stamp set); Studio Calico (wood veneer stars); Elle’s Studio (acrylic heart).